Just over four years ago, I got picked to be the recipient of one of a handful of fully funded PhDs at the University of Limerick, courtesy of the Irish Social Sciences Platform. The money that paid for this came from a fantastic initiative in Irish education to make research available and applicable beyond the academy, and to raise the profile of Irish research in a global setting. I got chosen because of my publishing history and my involvement with activism. Getting a PhD was a long-held ambition of mine, but I never thought I would have the resources to embark on such a thing. I don't know if anyone else in my family has one, very few of us have had the privilege of going to university at all. I'd heard that some PhDs were funded, but again, never thought that fat could be the focus of such work. I punched the air when I heard I'd got the scholarship, I knew it would change my life, and it has. Just over a week ago, I went to Ireland to sit the final oral exam for the PhD. I passed. 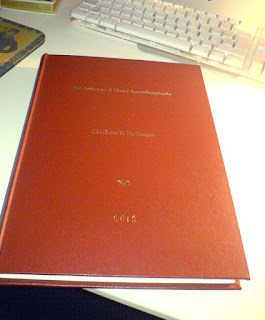 Today I went to get my thesis bound and sent it off to meet the deadline for the Winter Exam Board at Limerick. There are a couple of formalities to go, and a graduation ceremony in January, but from about now onwards people can start to think about calling me Dr Charlotte. Dr Fat will do too. Over four years I have worked really hard. As well as producing a 100,000 word thesis, an original argument based in original research, I have published peer-reviewed journal articles, chapters in edited books, and lots of other kinds of articles. I have given many conference papers, a handful of keynotes, and was proud to talk about my work at a fantastic gathering in Toronto earlier this year. I've produced and guested at workshops, made films that have shown at film festivals around the world, organised events, done a couple of artist residencies and a visiting scholarship. I've collaborated on projects with people, been involved with academic publishing in various ways, been the subject of quite a bit of media coverage, and maintained this blog. I can't count the number of conversations and emails that have happened because of this research, and I have been amazingly supported by people who want to see it out there in the world. By the way, the work that I have produced is, as far as I know, the first publicly-funded, community based, major research project into fat activism. I am proud of that. I'm sure I'll write more about the study as time passes. I'm looking for a publisher at the moment too, and would appreciate leads relating to that, if you have them to share. I have some plans for the future as well, but I'm not ready to explain them yet. Meanwhile, here's the abstract for the thesis, to give you more of an idea of what I've been up to. Over my 20 year involvement with the movement, I have come to notice that scant attention is paid to fat activism. Despite intensified interest in fat in 21st century Western culture, the richness of fat activism is not reflected in a somewhat meagre literature, and fat activists themselves have offered few reflective or analytic accounts that deal with the depth and breadth of what they do. Fat activism offers tools with which marginalised people can adapt and develop agency, community and capital, and contribute to social change. It has the potential to transform obesity policy from that which further entrenches fat people's abjection expensively, to that which builds on resources more compassionately and dynamically. This research project, therefore, represents one such attempt to hasten its development and overturn the trend in which fat activism is routinely assumed, taken for granted, and dismissed by activists, researchers, and institutions. I begin by situating the research within the existing literature and go on to clarify what fat activism is, to relate it to discourse, and to build on existing theoretical work. I argue against creating universal definitions of fat activism, and invite appreciation for its more ambiguous forms. I produce an assemblage of fat feminist origins and travels, arguing that as well as being an unlimited phenomenon, it is plural, hybrid and evolving, yet suffers from stagnation. I propose that, instead of reproducing collateral damage through discourse, queering fat activism includes many communities of interest, questions binaries, and welcomes multiple interventions. I use a scavenged autoethnography, bringing myself and the communities of fat activists to which I belong, into this work. This methodology draws attention to standpoint in the construction of fat narratives, expresses my frustration at reproductions of fat people as lifeless and passive empirical subjects, and synthesises activism and research. I've been going through some of the family photographs that I inherited after my dad died a couple of months ago. One of the things that has caught my eye has been how family photographs constructed me in the family as fat. What I mean by this is that I can remember when the pictures were taken, the kind of talk that went on about them in my family, and how these pictures in particular were supposedly evidence that I was fat, and therefore deficient. There are fat people speckled across my family tree, but I don't think of it as being a fat family. I think I'm the fattest of the generations that I know. I've tended to think of myself as always having been fat. What's interesting to me in the family photographs is that I'm not fat in all of them. I'm quite thin in a bunch of them, and mostly pretty normatively-sized. I haven't always been fat. I don't know what this means in terms of me constructing my own fat autobiography, I'm getting my head around that at the moment. I'm wary of thinking along the lines of trauma making me fat, or emotional problems, or that my fatness is evidence of pathology. I think it's more complicated than that. Mostly I don't care why I got fat because I'm pretty sure that I'm unlikely to get any thinner. Between 1975-1977 I lived in Hong Kong, close to a beach. I spent a lot of time on the beach, and there was generally a camera about. 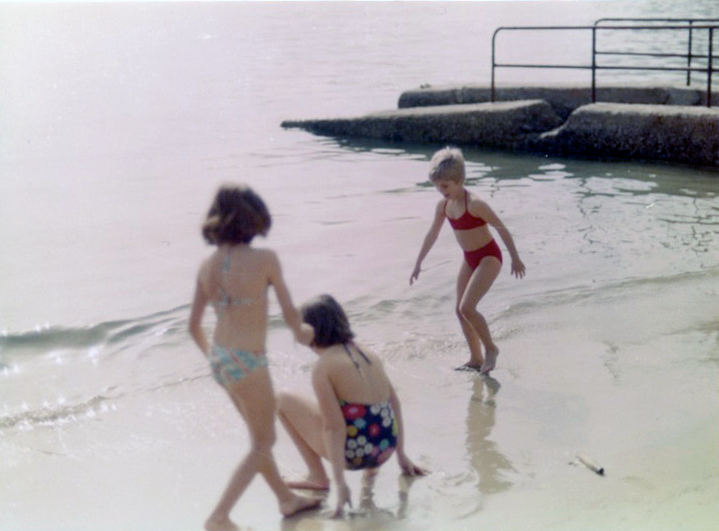 Dad had bought a fancy camera, taking advantage of the availability of technological bargains on the island at that time for people who had access to money. 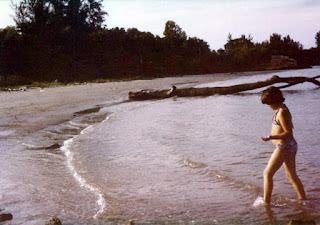 So I was photographed quite a lot in my swimsuit, playing on the beach. The beach is the place where I also learned to swim. I realise now that I was under quite a bit of surveillance but at the time I was oblivious to it. I want to share a handful of pictures from that period that represent the family lore about my presumed fatness. The way I'm talking about them is quite harsh, and may or may not represent what was actually said, but reflects the messages that I internalised about my body from the way it was represented in my family as I was growing up. 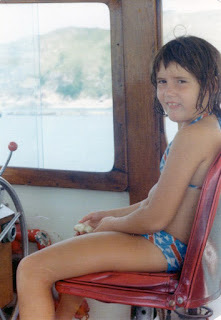 This is me sitting on a boat moored off a beach on one of the small islands surrounding Hong Kong. Dad knew someone who had access to a boat and we'd all pile on it on a summer weekend, a load of people, and go to a beach, swim ashore, then come home again. Idyllic! My slightly slumpy posture on the seat, and the tiny bulge of my tummy was taken as evidence of my fatness. I remember this photo being talked about, my tummy being pointed out. I thought of it as an ugly picture, something shameful. This picture was taken on a walk around an island. Mum and dad were part of an ex-pat community, and communal walks were a popular way of passing the time at the weekends. Here we'd stopped to eat. 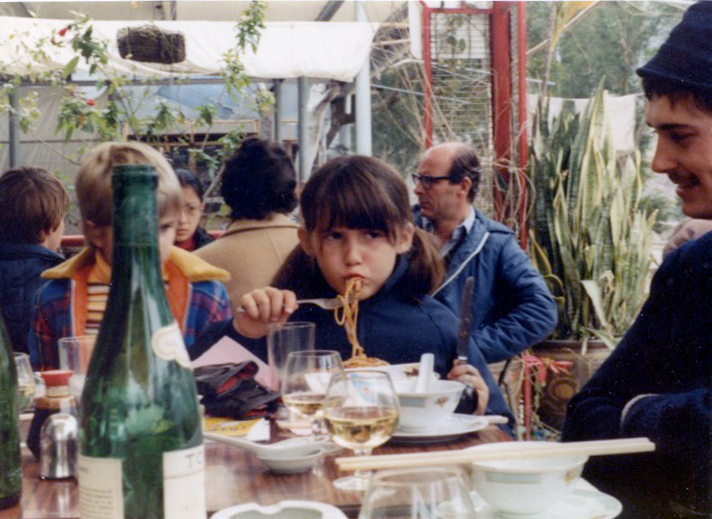 I had a plate of spaghetti, I remember it now all these years later, spaghetti Milanaise. I had trouble wrangling it from the plate into my mouth. I got cross and tangled up with it. This picture was regarded as evidence of my greed and clumsiness in the family, maybe because of the guy next to me, Andy, who's looking bemused. Looks like I'm giving him the stink-eye and refusing to be made the joke. I was an embarrassment because I couldn't eat in a ladylike manner. 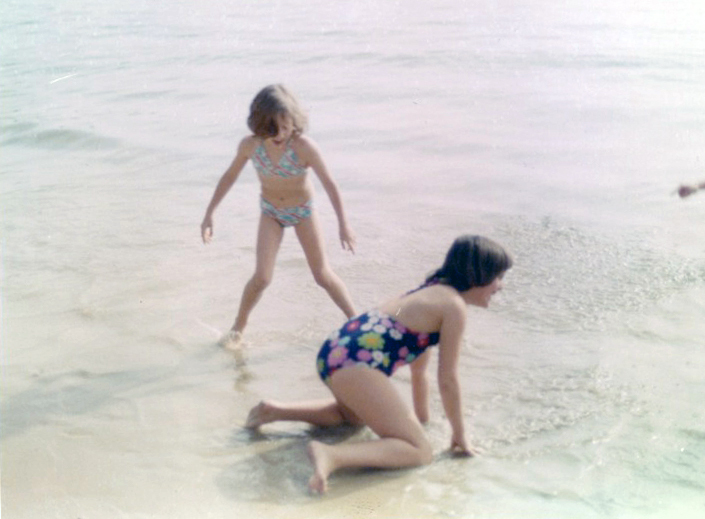 These two pictures are of me playing on the beach with my friends Kacey and Julia. I'm wearing a really fantastic halterneck swimsuit. We're all more or less the same age, but my friends are smaller and more wirey than me. I'm podgy in comparison, a bit of a lummox. I was aware of this difference at the time, but couldn't articulate it. I just had a feeling that I wasn't quite right. This is me on another beach in another country in 1977. By this time I had been dieted by my mum, the food restriction had begun, and family anxiety about the size of my body was now explicit. My tummy was always explained away as puppy fat, but it never went away, I always had it. It was never regarded as just the way I was built, it was always a problem.